Colors at Taj Mahal. Photo by Beth Whitman via WanderTours. 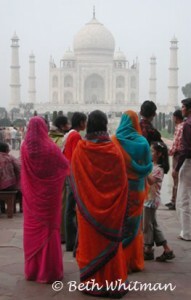 Ladies, get your sarees out: WanderTours is organizing a women-only cultural tour of Northern India. Led by writer Dianne Sharma-Winter, the tour will run October 25-November 9, with plenty of highlights in store. The tour begins in Delhi, where visitors enjoy Diwali, the Festival of Lights. During the tour, visitors also experience bustling cities, Buddhist temples and other holy sites, cremation ghats on the river Ganges, an animal festival, Indian cooking led by a local woman, and, of course, the Taj Mahal. The tour costs $4,725, which covers most expenses excluding airfare, some meals, souvenirs, and drinks. WanderTours seeks to attract travelers who enjoy the safety of traveling with a small group, but at the same time prefer to enjoy the company of like-minded individuals on their trip. The company offers cultural experiences that allow visitors to immerse deeper into the local culture. For more information, visit WanderTours. Read more articles about India on GoNOMAD. This is awesome. Thanks for sharing this wonderful information here. A trip to Northern India can be the unique lifetime remarkable experience.